BLOOMINGTON, Ind. 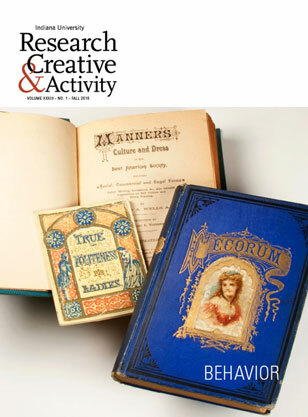 - Good, bad, risky, healthy, strange, independent, political, online -- the Fall 2010 issue of Indiana University's Research & Creative Activity magazine looks into the myriad ways that humans, and animals, act. Take behaving healthy, for instance. According to the American Diabetes Association, some 24 million people in the United States have diabetes, and nearly 60 million more are prediabetic, many without even knowing. It's an epidemic in the making, but "real-world" prevention programs can turn things around. One of those programs was created by IU School of Medicine researchers David Marrero and Ronald Ackermann. The plan focuses on a modest 7-percent weight loss, among other goals, and is being implemented through select YMCAs around the country. In "A 7% Solution," Marrero and Ackermann discuss the positive outcomes and stumbling blocks encountered with their program to change health behaviors and prevent diabetes -- a disease which, if not stopped, will "blow us out of the water" with future medical costs, says Marrero. Marrero's and Ackermann's diabetes prevention plan involves regular exercise such as walking -- in "Why We Walk This Way," anthropologist Kevin Hunt explains his studies of how humans got to be bipedal (moving on two limbs) in the first place. Hunt's work on the evolution of upright walking has taken him into the fields of East Africa to observe chimps, where he has developed his hypothesis that upright walking emerged in response to the need to balance and reach for food. "At some point in our long history, we stood up and began walking around on two legs," Hunt says. "The more I watch in the wild, the closer I am to understanding how and why that happened." Ilana Gershon and Ray Burke observe some very different kinds of behavior. Burke, E. W. Kelley Professor of business administration at IU's Kelley School of Business, studies the way shoppers react to the physical stores of today and the all-virtual stores of tomorrow. What are shoppers looking at as they navigate the aisles? What influences shoppers more -- price, brands, environment, layout? In "A Consuming State of Mind," Burke, an expert in "shoppability," describes the high-tech tools he uses to look deep into consumer behavior. Gershon, an assistant professor of communications and culture at IU Bloomington, looks deep into how people use new media to break off their relationships. Gershon's research, captured in a new book that's drawn attention from the likes of the New Yorker, the Chronicle of Higher Education, and Gawker.com, reveals an astonishing range of confusion over what it means to leave your lover using new media tools such as cell phone texts or Facebook. "Throughout every single interview," Gershon says, "people would say something about how they were using Facebook or how they were texting that made me think, 'You do what?'" In "Unfriend My Heart," Gershon tells us much more about digital "Dear Johns" in the 21st century. Indiana University's new Vice President for Research, Jorge V. José takes part in Q&A on IU research. Cognitive scientist Jerome Busemeyer explains how human decision-making and quantum theory are alike. Animal behavior expert William Timberlake reflects on a career observing how behavior affects learning. Painter Caleb Weintraub offers arresting glimpses of a future stripped of pretense. Political scientist Yvette Alex-Assensoh explores the role of immigrants in American politics. Ethnomusicologist Judah Cohen talks about the role of music in fighting HIV/AIDS in Africa. Sociologist Stephen Benard looks at how conflict affects the behavior of groups and their leaders. Researcher Erick Janssen discusses the forces involved in sexual risk-taking. Android scientist Karl MacDorman analyzes how humans react to virtual characters. The complete "Behavior" issue and back issues of R&CA magazine are available online at research.iu.edu/magazine.